Stars are very large and massive bodies in which thermonuclear (burning) reactions are taking place. The Sun is a typical star. It is so huge that its immensity lies beyond words and defies our comprehension. See the diagram on the left above, for which credits goes to Joe Leeson of Jet Propulsion Laboratory NASA. Even our Earth seems enormous by comparison with our ordinary daily lives. Although our Sun is only one of many trillions of similar stars scattered in the stupendous Universe, it is vast beyond our most fantastic dreams. 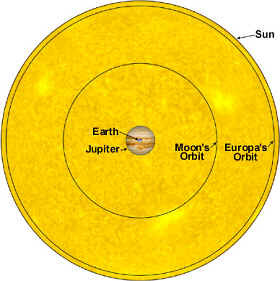 Something of its enormous size can perhaps be dimly grasped by looking at the diagram that compares our star with the size of the Earth, the planet Jupiter and the orbits of their Moons. At a average distance of almost 150 million kilometres from our Earth, the Sun is a few hundred thousand times closer to us than the next nearest star. Because of its ‘close’ proximity we are able to study our star in much, much greater detail than we can the other stars. The Sun is slightly flattened at the poles. It's Sun’s equatorial diameter is about 1,392,000 kilometres. This is equal to 109 Earth diameters and almost 10 times the size of the largest planet, Jupiter. It has about 333,000 times the Earth's mass and is over 1,000 times more massive than Jupiter. It's volume is 1.3 million times that of the Earth. The Sun was formed from a gas cloud which collapsed under its own gravitational attraction. When a temperature of about fifteen million degrees were reached that the main burning reactions kicked into action. The word burning has a different meaning in astronomy to its usual. In ordinary chemistry burning means a violent reaction in which a substance burns in the oxygen of the air. Examples are carbon in the form of coal burning to give carbon dioxide or hydrogen gas burning to give water. These processes are known as thermonuclear reactions and only take place at very high temperatures. The energy evolved in thermonuclear burning is enormous when compared to chemical burning. Hydrogen burning takes place at around 15 million degrees Celsius.